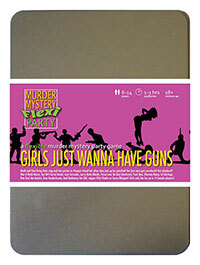 You've been invited to play the role of Rita Oral in Girls Just Wanna Have Guns. Heidi and Paul are throwing their pre-wedding parties at luxury spa and adventure resort, Pamper Island. But after one too many drinks, the bride and her entourage are invited to 'hunt the stag' with paintball guns - and best man Steve Wingman meets a grisly end! Can you find out who murdered him? Grab your guns and get ready for a facial at the luxury spa and adventure resort of Pamper Island! You’re wearing the softest white jacket along with a cleavage busting blouse and matching skirt. The girls have made you wear a stethoscope around your neck so people keep mistaking you for a doctor. Should have brought your drill! You’ve always been a ‘tooth’ person - it’s the first thing you notice about people. As a child, instead of playing with your dolls, you’d perform dental checkups and minor surgery on them. When clients are in your gas lift chair, you put them at ease by chatting mercilessly to them - that’s what endeared you to the bride, within a few visits. When you’re not filling and drilling, you play the cello and drink lots of wine - together, which seems to increase your playing ability. I’m Rita, your friendly neighbourhood dentist from the valleys. I like drilling, filling and giving things a good polish. I’m not your father’s dentist! Heidi and I have become good friends since I started seeing her every six months for checkups so it’s been an honour sharing this hen party with you it has, up to the point when that man got murdered obviously.